Activists occupied a property in Balbriggan on Saturday. FINGAL COUNTY COUNCIL has issued a statement strongly condemning the actions of a group of people who entered an unoccupied council-owned house in Balbriggan last Saturday. The council said that the property is currently undergoing refurbishment works, in advance of allocating it to an applicant on the housing waiting list. It also warned that any damage caused by trespassers in the property “may result in the handover of the property being delayed”. The property in Brega was returned to the housing stock in June of this year, the council said. 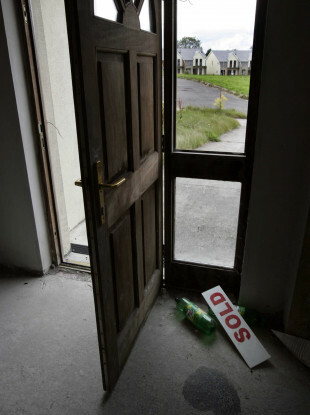 Sinn Féin’s housing spokesperson Eoin Ó Broin told TheJournal.ie that in cases where the council does have vacant properties that are being renovated to be put back in use, “it’d be better they’re not occupied”. “I’d urge people who are angry with the current situation on housing to focus on the long-term, particularly private sector vacant properties,” he said, citing recent action by the Take Back the City movement. Francis Doherty, head of communications at the Peter McVerry Trust, told TheJournal.ie that information on the status of vacant buildings is actually publicly accessible information, with people able to find out from their local council or councillor if a building is just lying empty or active work is being done on it. A Take Back the City spokesperson, meanwhile, told TheJournal.ie that its group – which has gained notoriety for high-profile occupations in Dublin city – was not involved with the Balbriggan occupation. The group’s protests have highlighted the issue of vacant housing in and around Dublin, which sees rental prices now €500-a-month higher than the boom. Fingal said that it has a “strong record” in relation to the turnaround time for void properties, and returning them to housing for use. “It cannot always be assumed that empty dwellings are in the possession of the Council as the resolution of legal or Tenancy situations may prevent the Council from carrying out works,” it said. Its vacant home officer – who is in the post a year – has identified around 200 properties across the council area as long-term vacant properties and potentially suitable for social housing. The council added these properties have been “prioritised for intense ownership investigation”, and that owners have been contacted with a range of options, including repair and lease, and purchase by the council. The council is also due to address the Oireachtas Joint Committee on Housing, Planning, Community and Local Government today. It will tell the committee that its work to bring vacant housing back into use is “very labour intensive and to bring one property back into use requires significant resources”. A small number of the properties are currently in the compulsory purchase order process, the council will say, with further properties to be added to this process in the future. “It must be borne in mind that prior to the economic collapse, significant residential development took place in the County with many inexperienced landlords investing in property,” it will say. As supply has not yet reached demand levels required, there are significant challenges to be dealt with yet. We are very conscious that more needs to be done and look forward to a continued strong working relationship with our partners in that regard. In an average year, Fingal will return 100 void properties to the stock, “many of which require significant works”. Dublin City Council will also address the committee today, providing updates on its work in this area. Tipperary County Council, meanwhile, will tell the Oireachtas that it has brought back 224 void properties “into the system” since 2017, it has been “engaging actively” with the Housing Agency in identifying houses held by banks and financial institutions with 26 units secured to date, and six more on the way. With soaring rents, and almost 10,000 people in the country homeless, activists occupying vacant homes is a sign of the palpable anger at the situation, but it shouldn’t come at the expense of people suffering due to the crisis, according to Doherty, from the Peter McVerry Trust. He said: “I don’t think there’s any excuse for anybody occupying the building that’s earmarked for works imminently. I think it’s really unfair to be targeting in this way. If somebody actually wants to know [the status of a vacant property] you can find out fairly easily. Email “Fingal council says vacant home occupiers could delay handover of property to those on housing list”. Feedback on “Fingal council says vacant home occupiers could delay handover of property to those on housing list”.